Call Back System: We have received your feedback about waiting in a queue when our call back system calls you. Unfortunately, due to technical limitations of our current phone system, this was a necessary inconvenience. However, in November we will be activating a newly developed program that will establish the connection with our support agent first, before dialing out to you. This way you will no longer need to wait in the queue when receiving a call back. You will, instead, be greeted by a courteous support agent immediately. Average Waiting Time: From Oct 2014 to Apr 2015, the average wait time was 2 minutes 34 seconds. After the call back system was introduced and staffing was increased, the average wait time was reduced to 2 minutes 1 second; a 21% improvement. Over the next 3 months, with efficiency training for our support agents, we expect those wait times to drop even further. Please also take advantage of our call back system by dialing zero (0) to receive a call back when an agent is available to speak with you. Contact Support Manager: For any concerns regarding the ClearDent Support team, please email Gary, the Support Manager at gchiang@cleardent.com or ask for him directly by calling our support line. We have received comments from some customers about the need to adjust the brightness of x-ray images. If you have experienced similar difficulties, here is a way to adjust every picture to your desired brightness level automatically. 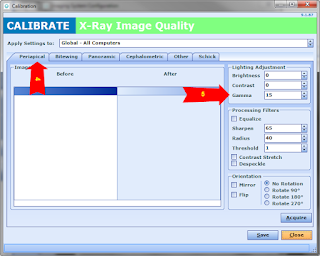 Bring up an x-ray you have taken recently and use the “Gamma” function to increase (+) or decrease (-) its parameter. This will make the shadowed/dark region lighter without making the x-ray look washed out. 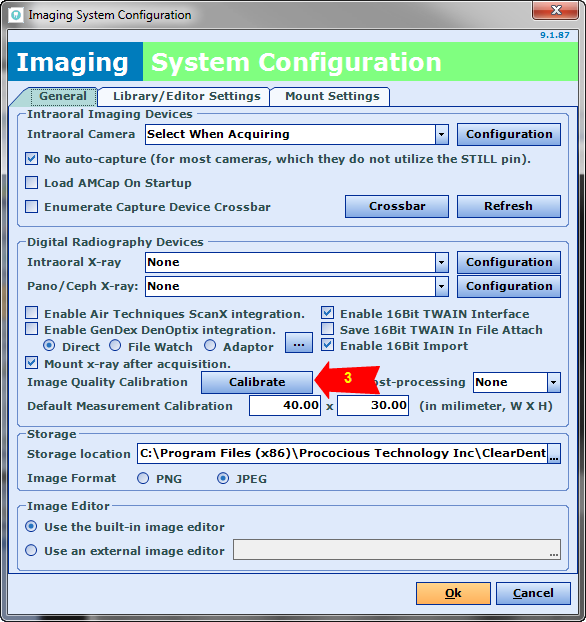 This is a more efficient way to get the image quality you want compared to adjusting the “Brightness” function. In the pictured example, the parameter we used was -30. Once you have determined your preferred parameter from your sample x-ray, click the “Settings” button to open the “Imaging System Configuration” window. 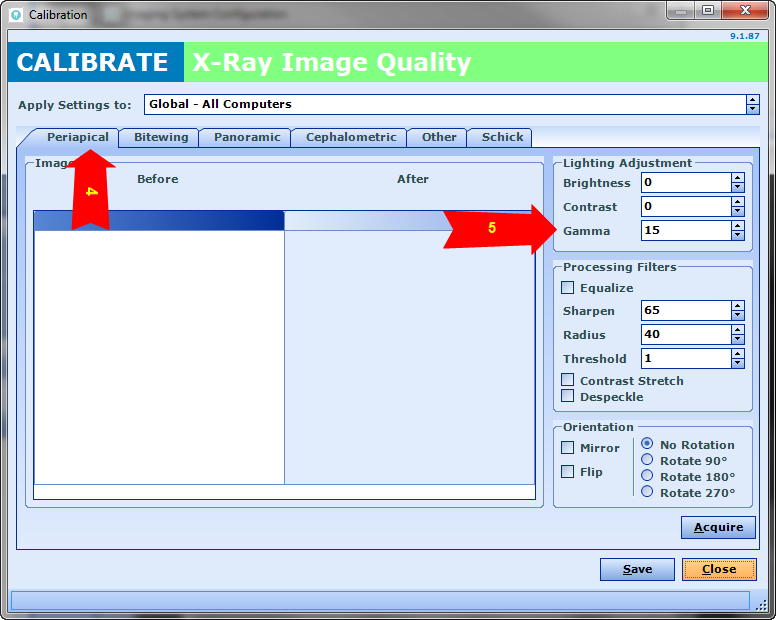 Click the “Calibrate” button to open the “X-Ray Image Quality” window. 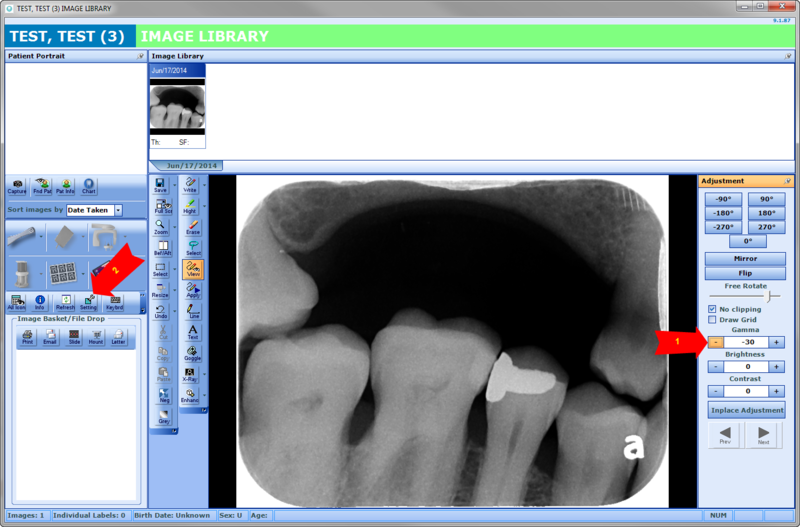 Adjustments need to be entered individually based on the type of x-ray (Periapical/Bitewing/Panoramic/Cephalometric/Other). 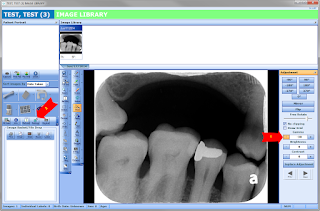 Usually, if you are adjusting an x-ray taken by a sensor, the same Gamma parameter should be entered into the Periapical and Bitewing tabs. If you are adjusting an x-ray taken from a Panoramic machine, the same Gamma parameter should be entered into Panoramic and Cephalometric tabs. Enter your preferred parameter in the Gamma field. In this example, the original Gamma setting was 15. With the new parameter we adjusted from step 1, the final Gamma parameter we should enter here is -15. This is because 15 + (-30) = -15. Update: Our phone systems are working perfectly once again. Thank you for your patience! Our phone systems are being worked on again. Please leave a message a we will respond shortly from another line. Thank you, again, for your patience.